Welcome to the BooksByJim.com site!! My latest book, What’s a Picture Worth? 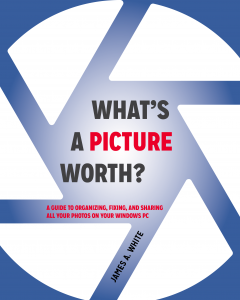 : A Guide to Organizing, Fixing, and Sharing All Your Photos on Your Windows PC is now available in both paperback and Kindle editions! You know it well – you’ve taken tons of photos over the years and moved them over to your computer… but for what??? They’re all just in disarray on the computer and with goofy, useless file names like DSC02132015.jpg or IMG_090114_1244.JPG. They all sit there lifeless on the computer because, even if you wanted to find a photo, it would probably be a good 10 minute project. That’s where What’s a Picture Worth? comes in! I’ll teach you how to get that chaotic mess into an organized system where you’ll be able to find what you need in a heartbeat. I’ll also show you how to make better use of all your pictures to show them off with family and friends who would love to see them! Learn easy tricks to take better photos and help make photo collaboration easier. Leverage free software to fix a so-so photo and turn it into one that really pops. Back up your photos and share them so they’re not gathering dust in your computer. Discover efficient ways to organize, rename, and tag your photos so you can find any photo in mere seconds. Gain useful tips on taking better pictures and scanning old photos. If you enjoy my book, What’s a Picture Worth?, the greatest thanks you could give would be a good review on Amazon (click here)! How many digital photos do you have jumbled on your computer? A picture is worth a thousand words, but if you’re not managing your photos, they’re just wasting space on your computer hard drive. Or worse yet, you risk losing those priceless photos forever. “What’s a Picture Worth?” is a user-friendly guide to help walk you through how to organize, rename, and tag your photos so you can find any photo in mere seconds. 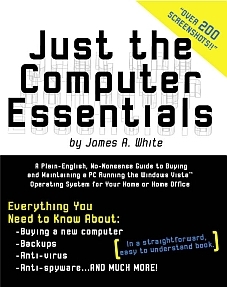 With over 15 years in the computer industry, Jim White knows the important balance of taking something technical and making it less complicated for the everyday computer user. He loves to learn the intricacies of how things work and then find ways to make them easier for everyone to understand. With thousands of his own photos, Jim has perfected ways to organize, fix, and share his photos and now wants to pass that knowledge onto you! The author will take you through how to backup your photos and how to share them so they’re not gathering dust in your computer. I’ve heard enough… take me to Amazon to get my copy of What’s a Picture Worth? Title What's a Picture Worth? You’ve seen the books for “dummies” and you’re beyond that – you know how to turn a computer on, check your email, and surf the Internet. There are books for geniuses that focus on getting over-detailed on technology you don’t care anything about. Why can’t there be a book for you – a book to help you buy a new computer or help you protect your computer and data without all the useless information?? ?